Just recently I came across a nifty little trick.. The requirement was for a Lync user who was not enabled for enterprise voice to be able to schedule meetings that offer a PSTN dialin number to meeting participants. Initially I was not convinced that this would be possible. 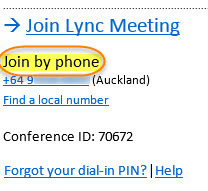 When scheduling a Lync Conference call from a Lync user that is not Enterprise voice enabled the conference invite is missing the Join by phone part of the invite. I did expect that behavior since you would need Enterprise voice enabled for the user to experience PSTN calling (I know its not great logic but made sense to me at the time). Arguably a user could have an Enterprise CAL allowing all the conferencing capabilities, including the Audio bridge access (Join by phone) – without having to be Enterprise voice enabled (perhaps no Plus CAL is available for the user in question). 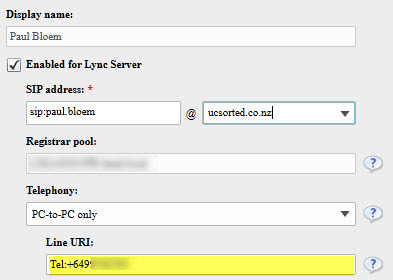 So the good news is that it can be done, simply populate the Tel URI field for the user in question. You don’t have a voice or dialplan policy associated to the user, but don’t need that as the inbound PSTN caller would be calling the Conferencing Audio Bridge.